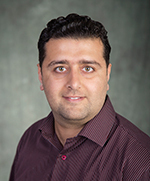 Mohamed Ali Ben Alaya is a post-doctoral research fellow with the Global Water Futures project working on a climate related precipitation extremes project, in which he is studying estimates of precipitation extremes to inform engineering design. Mohamed Ali gained his PhD and MSc in Water Sciences at the INRS-ETE in Quebec, and hold an engineering degree in Hydro-meteorology from the National school of engineer of Tunis (ENIT, Tunisia). His research interests include statistical climate downscaling and flood risk assessment in a changing climate. He is a reviewer of journal of climate, Journal of applied meteorology and climatology and stochastic environmental research risk assessment. His PhD work focused on the development of new probabilistic multisite models for precipitation and temperature downscaling. Ph. D. in Water Sciences, National Institute of Scientific Research - Research Center of Water, Earth and the Environment (INRS-ETE), Quebec, Canada. Sep. 2011 - Marsh-2016. MSc. in Water Sciences National Institute of Scientific Research - Research Center of Water, Earth and the Environment (INRS-ETE), Quebec, Canada. Sep. 2009 - Jul. 2011. Ben Alaya, M. A., F. Chebana, and T. Ouarda, 2015: Multisite and multivariable statistical downscaling using a Gaussian copula quantile regression model. Climate Dynamics, 1-15. Ternynck, C., M. A. Ben Alaya, F. Chebana, S. Dabo-Niang, and T. B. Ouarda, 2016: Streamflow Hydrograph Classification Using Functional Data Analysis. Journal of Hydrometeorology, 17, 327-344. Ben Alaya, M. A., F. Chebana, and T. Ouarda, 2015: Probabilistic multisite statistical downscaling for daily precipitation using a bernoulli–Generalized Pareto multivariate autoregressive model. Journal of Climate, 28, 2349-2364. Ben Alaya, M. A., F. Chebana, and T. Ouarda, 2014: Probabilistic Gaussian Copula Regression Model for Multisite and Multivariable Downscaling. Journal of climate, 27, 3331-3347.